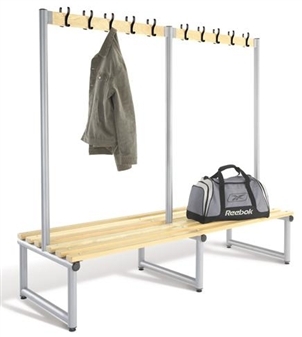 Double Sided Coat Hook Bench for the cloakroom or changing room, offering a robust and attractive solution for cloakrooms in a variety of settings. 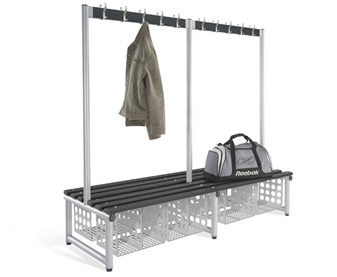 Ideal for school changing room areas, sports hall and gym changing, and fitting a variety of educational and leisure cloakroom needs. The virtually unbreakable polymer coat hooks have been ergonomically shaped, and contain anti-bacterial elements, effective against MRSA. They come in a choice of 5 colours. 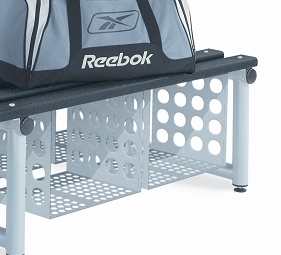 The double sided bench comes in a choice of 3 lengths and with standard floor fitting anchors. 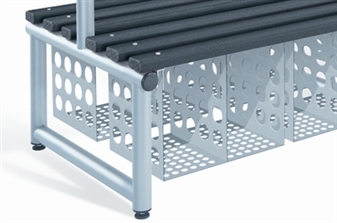 It comes with a robust 50mm round, thick wall tubing frame with welded joints, which comes in a choice of 7 colours. The slats come in solid timber (Ash), or as black food grade polymer slats, containing high performance anti-bacterial elements, (which are effective against MRSA). 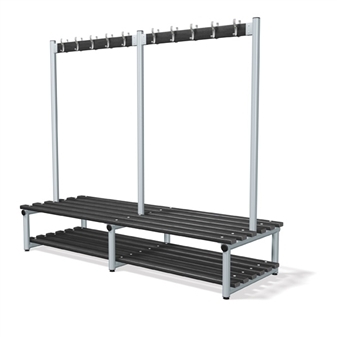 There are optional extras including base shelf slats for further off-floor storage, and also optional shoe/storage baskets, single compartment or twin compartment, which can be supplied for under bench storage. The benches come with a 5 year guarantee.